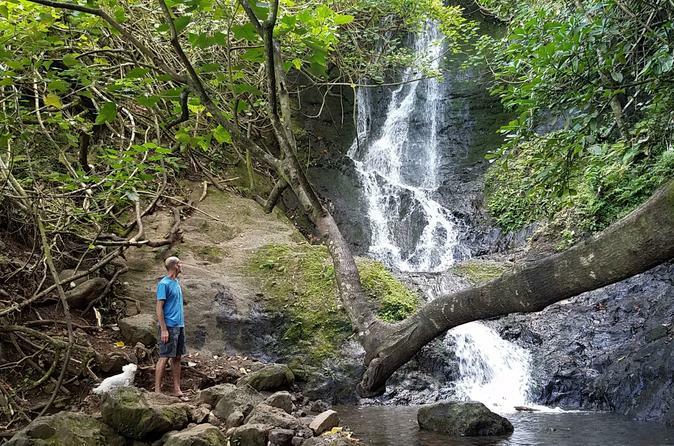 Discover a hidden waterfall on this Hawaii hike and drive tour. You will begin discovering the hidden hiking treasures of Oahu’s lush volcanic rainforest. This moderate 2-mile round-trip guided hike is a great opportunity to explore Hawaii’s lush tropical rainforest, experience tranquil streams and view a stunning Hawaiian waterfall. We hike at two locations as follows: Mon thru Friday, join us and experience the majestic beauty of the tallest waterfall on Oahu with a 150-foot cascading waterfall. From Waikiki, our professional nature guide will shuttle you by van to our 75 acre private tropical rain forest in Manoa Valley. You’ll be issued trail snacks of dried fruits and nuts and a water bottle. Optional rain poncho offered as needed. Then take a narrated nature hike 2-miles r/t along a jungle stream with ancient rock terraces and mountain pools to view a 200 foot waterfall. You’ll then hike back thru a bamboo trail viewing the many tropical plants, flowers and trees. Then, onto our relaxed East Oahu Explorer tour with scenic stops along the way at Hanauma Bay, Halona Point (Blow Hole) and Sandy Beach Park. Then a rare opportunity to drive up Kamehame Ridge to the Koolau summit. From here, take in the incredible views of two sides of Oahu from one scenic point. For the hiking savvy, take a short half-mile hike along the Koolau summit trail for a birds eye view of the beaches below. Return to Waikiki by van.